You may have noticed them in our shops — the fuzzy, verdant green clumps floating around in bowls or vases with water. They’re called Marimo, and they’re just as interesting to learn about as they are to look at. In this journal post, we’ll delve deeper into what exactly they are, the mythology behind them, and how to take care of them. 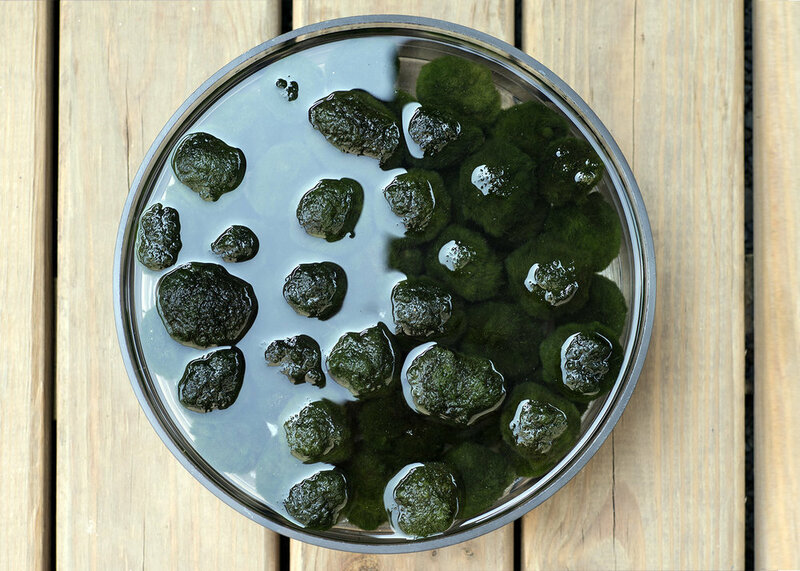 Despite the common name of “moss ball”, Marimo aren’t a type of moss at all; rather, they’re a rare form of a species of algae that, over time, grows into spherical clumps. Contrary to popular belief, there’s no rock in the center holding everything together - it’s simply algae. In nature, Marimo exist in a few freshwater lakes throughout Australia, Scotland, Japan, Iceland, and Estonia, and have been known to live up to two hundred years. In these lakes, Marimo form tight colonies covering the bottoms of the lake floors in a sprawling, green carpet. Perhaps the most interesting thing about Marimo is the mythology surrounding them. In Japanese folklore, Marimo are synonymous with love. The folklore revolves around a Japanese tribal chief’s daughter, who was in love with a man her father didn’t approve of. When the chief forbade their relationship, the star-crossed lovers fell into the waters of a nearby lake, and their hearts became Marimo balls. Because of the story, Marimo, especially in Japan, have become symbols of love and prosperity for their owners. Given that they naturally form at the very bottoms of lakes, Marimo don’t need much light. 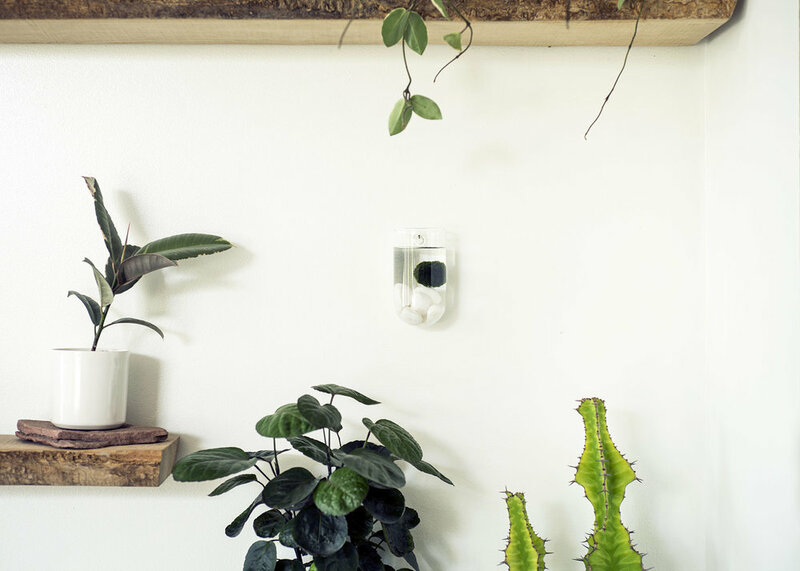 While it’s still important for them to see some source of natural light, they’re not going to need as much as a succulent, cactus, or larger tropical plant. Too much sunlight, and Marimo can easily scorch and turn brown. Mare sure that your Marimo isn’t getting any direct afternoon sunlight; diffused light is best. One of the wonderful things about aquatic plants is that you don’t need to worry about watering. However, it is important to change out the water every so often — we recommend about once a week, using tap or filtered water. When changing out the water, it’s important to keep the water at room temperature to prevent burning the Marimo. In nature, the freshwater lakes help roll them along the floor, maintaining their spherical shape. In the home, the best way to mimic this is to either gently squeeze and roll the Marimo around in your palms, or you can also gently agitate the water inside the enclosure you choose, allowing your Marimo to sway slightly as they would in nature. Any questions about Marimo you think we missed or topics we should have brought up? Comment down below or stop into one of our shops to check them out and chat with us!